I had never heard the Gettysburg Address orated before. What a spine-tingling experience. Ronaldus Magnus is my favorite president. I wonder when politicians dispensed with writing their own speeches, and began farming them out to speech writers and PR committees? Rhetoric is no longer a style of writing and talking, but a form of distracting and defeating one’s political opponent. No all you hear in political speech is the pestilential stench of decaying humanity…. Hi Bern! Give willie a hug for me! I really like Teddy too. Hi, thanks for following my blog! I don’t recall ever learning any grammatical rules so you will probably be horrified at what you read there. BTW, you don’t seem to have set up any widgets on your blog to allow readers to access your past posts via categories or tags or even an archive, and read them – given your aim with the blog, it would help because readers could go to a category (Eg adverbs) and look at all the posts you’ve written about it. Don’t forget Lincoln’s quote, ‘If I were two-faced, I wouldn’t be wearing this one.’ That gets him my vote. And talking of grammar…should it be ‘obligated’ or ‘obliged’ above? Or is this American usage? Thanks for visiting and following my blog. Yours in pedantry, Richard. Cheers! McPherson does a good analysis on this angle.. I was struck when you said “When simple phrasing would have sufficed, Lincoln used such beautiful, poetic wording,” because I like it for an almost opposite reason. Most speeches from that time that I’ve come across are long, rambling affairs, with over-extended sentences full of nested sub-clauses and high-falutin’ Latin. Lincoln spoke in everyday English. Poetic, but simple. You can imagine Churchill reading it, and he was a man who deliberately chose bluntness over erudition. If I had to pick a favourite, I’ve always had a thing for Elizabeth I’s speech at Tilbury. I have no idea why—I just like it. I didn’t know that about Roosevelt! Neat! This is random and off-topic, but just yesterday I realized that… there’s always a first lady! Why is that?? There are lots of powerful, single men. Right? Aren’t there? Hmmm. So then I had to look it up, and I found that only three men have been elected while single, and of them one’s wife had died prior to his election (Chester Arthur), and another was married while in office (Grover Cleveland – what a wedding ceremony THAT must have been, huh??). The lone U.S. President to live out his life as a bachelor was James Buchanan. The art of speeching is underestimated. Some people just got it. Nice post. Theodore R. is an interesting character. Milwaukee is where he shot during his 1912 presidential campaign. 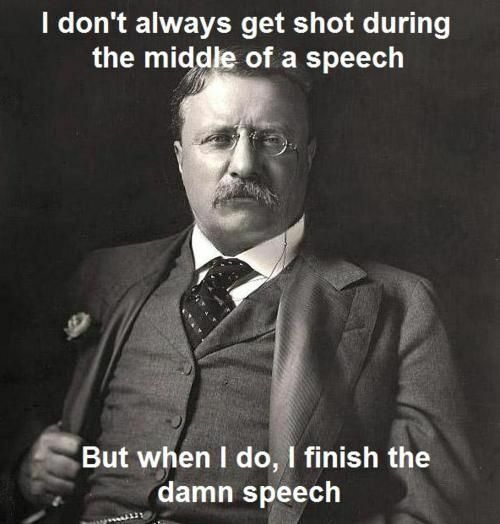 Teddy Roosevelt is one of my favorites too! Mostly because he was a man of true action not just fancy talk, but also because of the extensive work he did for conservation that preserved many of the National Parks remaining today. But truly anyone who can read, write, and speak for him(or her)self well is deserving of leadership – so Lincoln makes that list too. Thanks for sharing! My favorite President is President Abraham Lincoln, for the same reasons you write about. He was (and is) a great God fearing man; with humble beginnings, the ambition to achieve great milestones, and words of wisdom that were beyond his years. For someone with little to no school-house education and a life of hard manual labor – Abraham Lincoln, to this day, is one of the most quoted American Presidents in U.S. history (Obama and the Bushs’ don’t count). Thank you for sharing this post! Believe it or not, George Washington not because of what he did but for the mysterious background he had as a general and not as a president, How such a man could have such a horrific tale represent America amazes me. Hey, can you put up some “like” buttons on here, because I really like you blog! 🙂 My husband is obsessed with George Washington, and does portrayals of him in Western Washington State. So guess I better say he’s my favorite president. I agree with you AND Alex—TR and Lincoln are tied for my favorite presidents. TR definitely is the original “Most Interesting Man in the World” and Lincoln, well, he’s Lincoln. How can anyone top them? Thanks for following me over at FieldworkInStilettos! Grammar is the bane of my existence but this post was great 🙂 I visited the TR house in LI when I was a kid and it was GORGEOUS!!! Lincoln’s language skills rested on the very solid foundation of the King James translation of the Bible (1611), which was intentionally translated with an ear to being read aloud, and which uses a vocabulary of only 8000 words — so that even the uneducated could hear and comprehend “the Word of God.” This translation of the Bible has its roots in that remarkable blossoming of the English language that took place during the Elizabethan age, which produced, among others, Shakespeare. In the frontier setting of Lincoln’s childhood, if any book was available, it was most likely to be this Bible. From what I remember of Lincoln’s biography, his first encounter with the written word was this remarkable book, which molded Lincoln’s language in its formative years. It’s linguistic fingerprints are all over the Gettysburg address. Lincoln was a self-admitted “man of the people” — a self-made man — the living embodiment of what America was all about, that a man born in a log cabin could attain the highest office in the land, that any American could rise to the peak of power, not because of birth or class, but on their own merits. — I think that one thing is what we love most about Lincoln — he personifies the American dream. Oh, and you should put an RSS feed thingie on your blog so that those of us who use feed readers (like me) can add your feed to it. A feed reader lets you put all the different types of feeds you can follow (including news feeds like newspapers, magazines, etc., as well as blogs) all in one manageable place. WOL, if you’re using Firefox, try this addon. It puts an RSS thingy in the address bar, wherever the service is available. There should be an option in Dasboard→Appearance→Theme options to show/hide the RSS icon that WOL’s asking about. I hid it on mine, because it takes up a huge amount of screen space for just one little icon. lol. Yep, that got it. I clicked it, and got your RSS feed in my mail-client, so it works fine. Also, I would like thank you for following my blog. I hope I don’t disappoint you and that your visits in my blog have been and will always be a joyful ride. The Address IS a wonderful speech. When I danced in high school we did a production number (about 8 minutes long with numerous dancers) called Gettysburg and in between the dancing portions the Gettysburg Address was said. It was really great. From doing that production, I learned the majority of it by heart, but it’s been so long that I don’t remember it all anymore. Thanks for reminding me of it. I heard that he wrote it on his way to the ceremony on a envelope or something, not sure how true that is, though! Political speech always makes me suspicious – more so when it’s very good. Your question had me thinking though about speeches placed in the mouths of historical figures by others – Marc Antony’s “Friends, Romans, countrymen, lend me your ears. I come not to praise Caesar, but to bury him” (of course, he proceeds to praise him) was top of my list. Thanks a lot, Shakespeare. As for favourite president – perhaps I lean towards another Roosevelt. But FD, rather than Teddy. I enjoyed reading this. I shared it with my friends on Facebook. Look forward to more great reads! My favorite President? Hmm. I don’t know. If you’d asked me any other time, I would’ve said Abraham Lincoln. When I was in middle school, I had a slight crush on Thomas Jefferson, haha. Anyway, I’ve been reading “Destiny of the Republic” recently, and it’s about James A. Garfield, one of the lesser-known Presidents because he got assassinated before he could do much. And I’ve learned a bit about him that makes me like him. I especially like that he didn’t promote himself to get the Republican nomination and didn’t really want it . . . That makes me a little sad that he became the President only to be assassinated shortly after. I’m not American, not even from the Northern Hemishphere (nor, I supose for that matter, from the 19th Century) – but I love that Gettysburg Address. It is a stunner. Agree on all accounts. Lincoln’s speeches give me the chills. Beautiful writing. I appreciate the care and craft that go into your posts. Excellent blog–succinct, compelling, informative AND humorous. Wow! Congratulations and cheers. Love reading your blogs – crisp, witty and thoughtful. Oh yes, Lincoln was a unique personality of a president, at least one of my favorite. And I love speeches so much that I even wrote my dissertation back in college dealing with famous Americans’ speeches. So not only presidents (the Gettysburg Address WAS included! ), but also Chief Joseph, M. Luther King Jr., etc. I must add here that speech-wise, I really love the sound bites of JFK. Or, for the matter, the three-step lists by M. Luther King, Jr. – his March on Washington Address. Cannot choose just one. LIncoln, Reagan and Churchill. All 3 actually said something when they spoke; it wasn’t the sanitized, lifeless blathering we get now. These men led nations in critical times when it would’ve been easier to quit. Lincoln, a man of great honor and determination. Eloquent. I remember how Reagan reminded us of the greatness of America and urged us onward again after the ugliness and shame of the 1970s.